What a lovely soup. Can't wait to see what you do with it. I'm still trying to come up with ideas for my soup. LOVE the colors in your soup and congrats on your feature writ up. Looks like it's going to be a good one, Sandi! 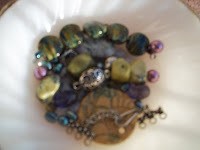 Glad to see your work getting more exposure -- I'm off to take a peek at the Bead a Day link, too! Love your soup, beautiful colors. This soup looks like fun! Love your beads! Such pretty colors. Have fun!